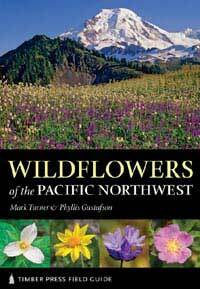 Two native plant enthusiasts, Mark Turner and Phyllis Gustafson collaborated to bring us an ample wildflower field guide for the Pacific Northwest, from British Columbia to northern California. Inside this book are 1220 rare and endangered plants, plus invasive weeds and everything in between that grow in the wild, in this region. When I am out in the field, I want a book that makes wildflower identification as fast and effortless as possible. This guide accomplishes just that. Wildflowers of the Pacific Northwest is divided into sections by flower color, and then further divided by the number of flower petals, followed by family, genus and species. With each entry providing a photograph, detailed descriptions and distributions maps, even amateur enthusiasts can easily identify unknown species they come across on a hike or growing on their property. This is the field guide of choice to place in any wildflower fan’s home library. For a hiker’s backpack, the cover and binding is made to take the rugged use outdoors.